Today I go back to my weirdest of specialties: Lizards. I don’t have a clue why— lizards are something I just happened to stumble on with the revelation that can draw them effortlessly. That’s not to say that they’re perfect lizards, or really accurate ones. They just sort of flow out of my pen without me thinking about it, whereas horses and cats are STILL a struggle for me. It’s never come in handy, and it’s never been something I’ve sold before, but there you go—life is weird. Today’s exercise was more about getting a handle on fine using a fine-liner pen without snapping the tip off. I’m also trying to regain my hatching chops, which I seldom use under the excuse of time-management. So that’s it for today. 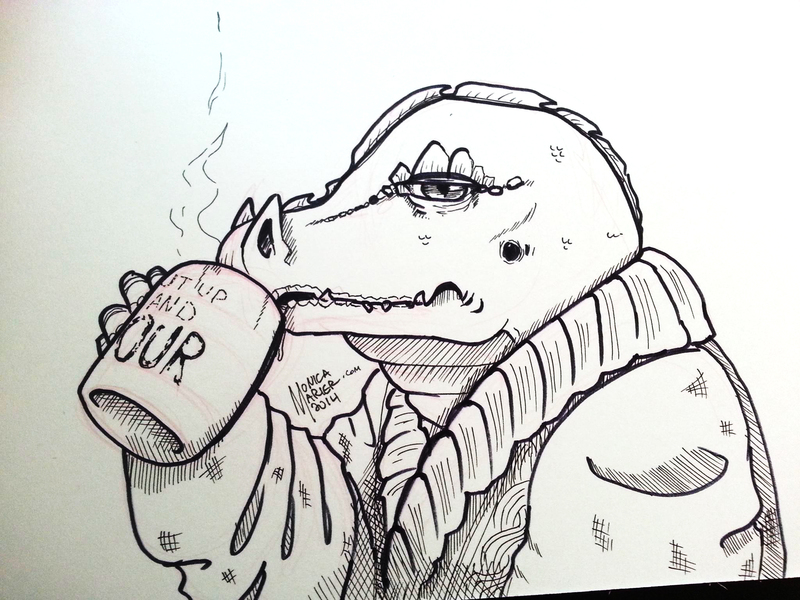 Lizards…drinking coffee… yeah. Ah this is brilliant too!